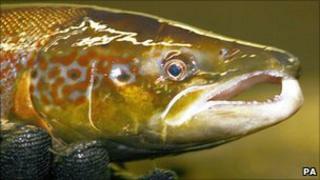 Two Scottish anglers are to take part in a legal test case over cross-border fishing rights. The men are being prosecuted for fishing on a tributary of the River Esk without an Environment Agency rod licence. Much of the River Esk is in Scotland, but the English agency is responsible for administering the entire river. Over the past few years, anglers on the Scottish side of the border have opposed the agency's right of control. But matters will now come to a head after charges were brought against two anglers who live in the village of Newcastleton, Roxburghshire. Ross Blaikie, 31, of Douglas Square, and Brian Scott, 45, of Scotts Street, pleaded not guilty at Jedburgh Sheriff Court to fishing for salmon or sea trout on the Liddle Water - a tributary of the River Esk - near Newcastleton, on 20 August, 2009, without a valid rod licence. Sheriff Kevin Drummond noted it would be a test case to challenge legislation brought in by the Environment Agency regarding the River Esk, and fixed a trial for 10 September. The Esk rises in the mountains to the east of Moffat, Dumfriesshire, and merges with the Liddle Water on the England/Scotland border before entering the Solway Firth in Cumbria.